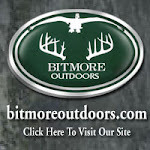 Bitmore Outdoors is an outdoor film crew based out of the Eastern Shore of Maryland. Follow us throughout the year to watch as we bring you our hunts weekly as they happen. Thank you for checking in! The Bitmore crew was busy spending their time steady goosin and duckin the last couple weeks of the season, but weren't neglecting time in the tree trying to get a few more deer. The trips to the tree were cold, very very cold but worth the chill.